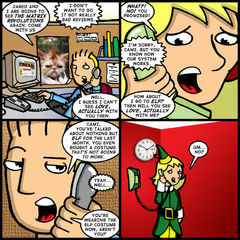 So as the strip indicates, I finally got around to seeing Elf on Monday night. I really enjoyed it, too. A lot of the funniest bits were used up in the trailers and television commercials, but curiously, I didn’t care. Will Ferrell is such a joy to watch, it never even fazed me. All those reviews that said Elf was going to be a new holiday classic sound a little ambitious, but they’re not far off the mark. When it comes out on DVD, I know I’m going to buy it. And after I own it, I know I could watch it over and over. Truthfully, I’ll probably go back a see it a second time when it still in theaters. The feeling it gives you is just that good. Admittedly the conclusion starts to get a little sappy, but they wrap it up nicely with a recap of the characters a few years later. James Cann does the hurried, New York executive thing to a “T”, but I couldn’t help but think how a method actor such as himself probably didn’t have to stretch too far to get annoyed with Ferrell’s antics. Those two look like they would react as oil and water in real life just as easily as they do on film. Changing gears, I want to take a minute to call attention to our newest sponsor Phancy Pants. I’ve known co-creator Kiel kind of informally for a while. He’s a good guy and he’s got a great comic going for him. The site design is tight, too. Check it out! I also gotta give props to those who have been donating to The Walk of Fame. Did you know if you donate five dollars or more you can get a cool Matrix-inspired Theater Hopper desktop wallpaper? It’s true. But you don’t have to donate that much if you don’t want to. ANY donation amount will still get your name enshrined on The Walk of Fame. Something to consider! Friday will mark the 200th honest-to-goodness, drawn and written by me Theater Hopper strip. You might remember we crossed the milestone once before, but that was back when there were guest strips in the archive (you can find those now on the bonus materials page) but they were moved to represent a more honest count. I don’t have anything planned for the occasion, but I’ll probably have more to say about it on Friday. In the meantime, I just wanted to give a brief thanks to you guys for helping me get there. Thanks.